Our company began in 2000, in a small warehouse in Nashville, TN, with a man that had a passion for cigars and pipes, as well as a vision and business model that was unlike anything else in the market place. In 2003, the company moved to the Myrtle Beach area already positioned to become one of the top pipe retailers in the world. 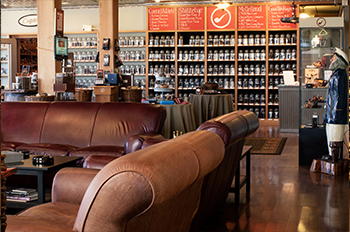 In 2004 renovation began on a one hundred year old building that would transform it into the ultimate Cigar and Pipe Emporium, complete with walk-in humidor, hammered tin ceilings, hardwood floors and a plush smoking lounge. We take pride in all aspects of product offered, in creating the best possible shopping experience for our customers and our unflinching obsession in post sale customer service. At the heart of all of this is what we believe to be the finest staff of its kind on the planet...and that man with a vision.